Visit jcdanczak.com from any mobile device today! For a limited time save 15% on Stationery Boxes, Ziplock Bags, Clear Plastic Tubes, Corrugated Cartons,Crystal Clear Bags and all of our products. 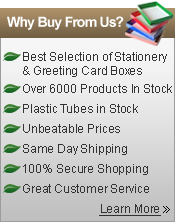 You are sure to find the items you need as we have over 6,000 products ready to ship today! Enter Code: (Expired)at checkout. Shop Now and Save!